National Center for Biotechnology Information (US). Genes and Disease [Internet]. Bethesda (MD): National Center for Biotechnology Information (US); 1998-. National Center for Biotechnology Information (US). Bethesda (MD): National Center for Biotechnology Information (US); 1998-. The skin is the largest organ in the body — both in weight and in surface area — and separates the body's internal environment from the external environment. The skin has many diverse roles. It acts as a channel of communication with the outside world; protects the body from water loss; uses specialized pigment cells, called melanocytes, to protect the body from ultraviolet radiation; participates in calcium homeostasis by contributing to the body's supply of vitamin D; and helps regulate body temperature and metabolism. Elastic tissues such as the skin require a strong and resilient structural framework. This framework is called the extracellular matrix, or connective tissue. The orientation of the connective tissues — adipose (fat cells), cartilage, bone, tendons, and ligaments — found beneath the skin are also key for tissue appearance and function. All connective tissue is composed of three major classes of biomolecules: structural proteins (collagen and elastin), specialized proteins (fibrillin, fibronectin, and laminin), and proteoglycans. Some skin and connective tissue diseases, such as those discussed in this section of genes and disease, are due strictly to genetic inheritance, while others do not have specific gene abnormalities as their sole cause. Many features of skin and connective tissue disorders overlap with each other, and with other disorders, even though they have unique genetic causes. National Center for Biotechnology Information (US). Genes and Disease [Internet]. Bethesda (MD): National Center for Biotechnology Information (US); 1998-. 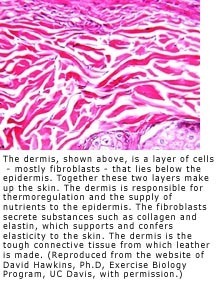 Skin and Connective Tissue. A mutant gene can cause skin to blister. What do you look out for when checking yourself for skin cancer?